From the early 1910’s onwards, “sukiyaki” and other meat dishes began to appear on the dining tables of homes in Japan. Since then, these dishes have become the chief treat when eating something special at home. Yet, until the late ’70s, which meat was “Kobe beef” was not clearly defined. There was no way to prove if the meat you thought was Kobe beef was actually real, authentic Kobe beef. At around this time, consumers also started asking where it could be bought. 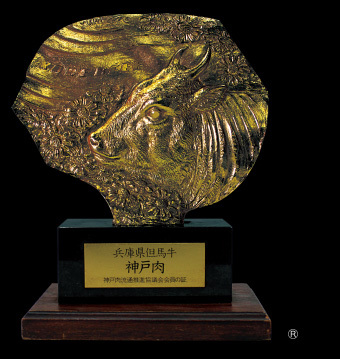 This was the driving force behind producers, meat distributors and consumers joining forces to establish the Kobe Beef Marketing & Distribution Promotion Association in 1983. The Kobe Beef Marketing & Distribution Promotion Association looks forward to your comments and opinions.We hope to reflect these in our promotional activities so that you can all enjoy Kobe beef that has been certified safe and authentic. Yuki Shintani studied sculpture in Italy, and exhibited at the 1967 Rome Biennale exhibition. In Japan, he has received numerous awards at the Niki-Kai Exhibition and all art exhibitions in the Kansai region. In 1989, he was awarded the Kobe City Cultural Commendation Prize.